Isabella won AOP Grand Champion Senior doe again in 2017 at NAILE. She was also part of the first place Senior group of three and first place Get of Sire. 2018 was the third year for Isabella to win Grand Champion Senior Doe at NAILE. She was also part of the first place Dairy Herd and first place Senior group of Three. Isabella won Grand Champion Junior Doe in ring 2 at the Lebanon, TN show 5/4/2013. Best of Breed, Best Udder in Breed, and Best Senior Doe in Show at the Tennessee Valley Fair 9/13/2014. These 12 hour udder photos were made 5/15/2017 before milk test. 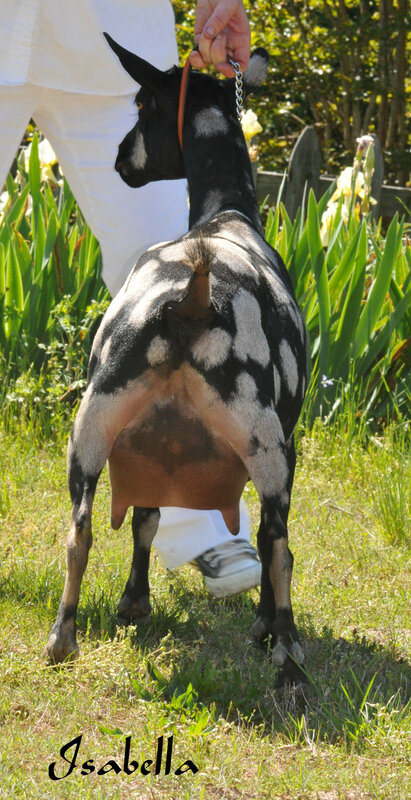 Heleena, Isabella, and Fortunata were often winners in a get of sire group class. Isabella (center) was a first freshener in these two group pictures at a show in 8/2014.